6 Wedding Venues in Delhi Which Allow Outside Caterers! For brides-to-be, nothing sounds sweeter than “The venue has been booked”. We know the lengths to which every bride goes to find her perfect venue. However, the search doesn’t end there. Once you find your venue, you have to make sure that everything else is just right and that your guests have an amazing time! To help you out with this, today we have a list of some of the best banquet halls and wedding venues in Delhi which allow outside caterers. So along with a stunning venue, you can be assured of impeccable service with delicious food, as chosen by you. These wedding venues in Delhi are as elegant as it gets and are sure to impress your guests with stunning decor and flawless service. Choosing a wedding venue with open catering is a good idea as it lets you customize the menu as per your event and requirement. Scroll on to find out more about these mesmerizing venues. Aesthetically decorated hall and lavish green lawns await your guests at the Imperial at the Mallu Farm. The in-house decorator of this banquet hall in Chattarpur ensures that every event is made unique with outstanding decoration and lights. While they take care of the decor and service, you can get your own caterer to treat your loved ones to a sumptuous feast. The Kundan is one of the most sought after banquet hall in Kapashera which offers open catering. 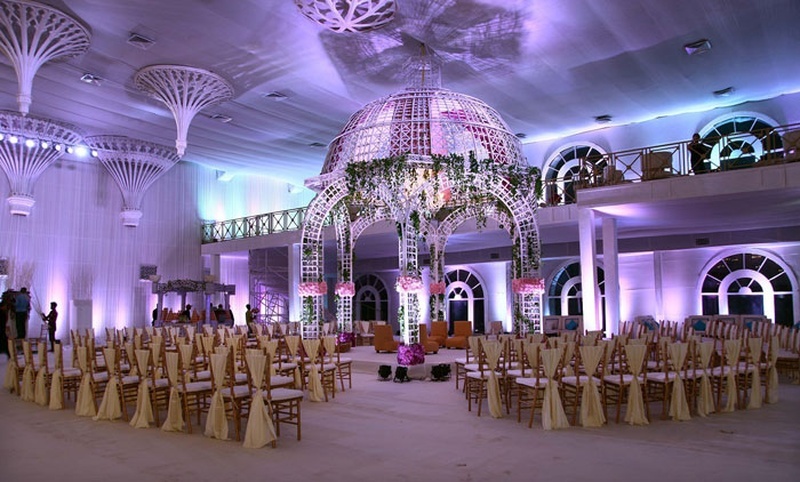 With their expertise and efficiency, your guests are sure to enjoy unparalleled service in a stunning hall and lawn. For the finishing touch, you can get your favourite caterers and delight your guests with mouth watering delicacies. With an elegant hall and a sprawling lawn, Satvik by Chhabra Farm is truly one venue you must check out for your special day. It has flexible catering and decor services, making it an ideal choice for a glam wedding. You can customize the space as per your theme or ideas and the choice of your caterer can whip up the most delicious wedding feast for you and your guests. With two lawns and a hall, Calista Resort in Kapeshera is one of the most famous wedding venues in Delhi. It has all modern day amenities and prides itself on its unmatched customer service and satisfaction. They have an in-house team of caterers and you can also get your own for that ultimate wedding feast! Whether you have a pre-wedding ceremony, a wedding or a reception – Orana Hotels & Resorts can cater to everything. With two halls and two lawns, it is one of the best venues in Delhi where you can host your special day. They have an experienced team of decorators who can set up the place to suit your event while your choice of caterer presents the unforgettable wedding feast for your guests! With a huge banquet and a sprawling lawn, the Ritz at Ambience Golf Drive is a premier wedding venue in Delhi, which promises to make your big day a memorable one. This banquet hall in NH 8 has in-house decorator team by Ferns N Petals that can set up the place and make it seem like something out of a fairytale. To make the day truly special, you simply need to get your favourite caterer and treat your guests to a delectable feast.